Under the leadership of Dr. Benjamin Bloom, Bloom’s Taxonomy was created in 1956 in order to promote high-level learning rather than rote learning. Bloom’s Taxonomy is a language for teachers and educators. They will often use this pyramid to create learning objectives for their classroom, school, or school district. Bloom’s Taxonomy organizes learning into six categories: remember, understand, apply, analyze, evaluate, and create. The first category at the base of the pyramid (remember) is the basis of learning, and the highest category at the top of the pyramid (create) is the highest level of learning. A student cannot create something using a specific topic unless he or she can remember that topic. So, you cannot have one category without the other. To get to the highest learning possible, students have to practice how to remember, understand, apply, analyze, and evaluate first—all of which I will explain more thoroughly. What are the Six Levels of Bloom’s Taxonomy? 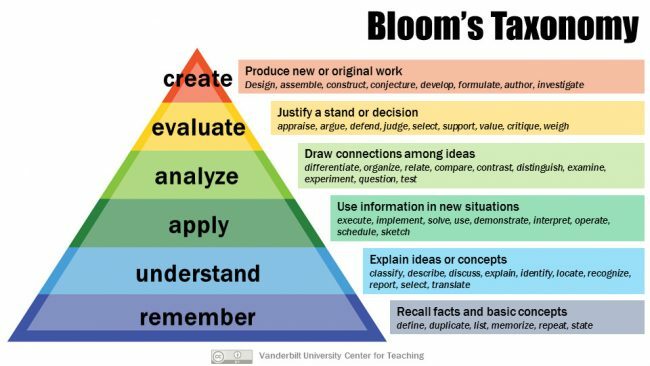 All categories in Bloom’s Taxonomy are important, but the ones at the top of the pyramid are higher level thinking. This means that they require a deeper understanding of a concept in order to successfully complete the tasks. The first three categories, remember, understand, apply, are lower-level thinking skills. Teachers will use these three learning objectives when they are introducing a new concept to the class. Then, as the class develops a deeper understanding, a teacher will create objectives with the higher level thinking skills: analyze, evaluate, and create. These objective tend to be used towards the end of a unit or the end of teaching a concept to assess how deeply a student understood a concept or idea. Below are explanations of each category of learning. Why is Bloom’s Taxonomy important? Bloom’s Taxonomy gives teachers the proper language for learning. When teachers create learning objectives for the lesson or unit, they usually refer to the Bloom’s Taxonomy pyramid. If you notice, the picture includes some sample verbs that would fall into each category. So, for instance, if a teacher creates a unit on measurement, a learning objective in the beginning of the unit may be “Students will recall that 12 inches is 1 foot,” and then, as they develop a better understanding of measurement, a learning objective may be “Students will solve story problems related to measurement and conversions.” Finally, as the unit draws to an end, a learning objective may be “Students will design a bedroom layout using their knowledge of feet and inches.” Notice that the verbs fall into different categories of learning: remember, apply, create. The teacher uses Bloom’s Taxonomy to scaffold concepts of measurements—before using higher order thinking skills, a teacher would use the lower order thinking skills to solidify a concept. What does this mean for parents? A basic understanding of Bloom’s Taxonomy will help you see where your child is on the spectrum of learning for a concept and where he or she needs to go to progress. Pay attention to the verbs in the directions or questions that your child’s teacher gives to your students to see what level of learning the teacher is using. All levels are important, but at some point, your child’s teacher should be using the verbs associated with analyzing, evaluating, and creating in order to challenge students and take them to the next level. At A Grade Ahead, our goal is to ensure that students have the knowledge, skills, and passion to become capable and confident learners who reach their full potential. To do this, we implement educational practices, such as Bloom’s Taxonomy, into our supplemental learning programs. We understand the value behind reinforcing and solidifying essential skills (which would be lower level thinking: remember, understand, and apply) and promoting critical thinking (which would be higher level thinking: analyze, evaluate, and create). At A Grade Ahead, we are also always improving. We see the value in investing into our programs because as jobs and technology change, education practices change as well to fit the needs of our children’s futures. That is why this year, in 2017, we have introduced hands-on learning into our program. Our focus with these hands-on activities was to reach the top of the Bloom’s Taxonomy pyramid and promote higher order thinking skills. We hope that our students can reach their full potential and prepare for their future in their academic and professional career with these new improvements. How is your child being challenged in school? Are Bloom’s Taxonomy and higher order thinking skills being implement in your child’s school? Let us know in the comments! Tags: bloom's taxonomy, what are the six levels of bloom's taxonomy?, what are the three domains of learning? bloom's taxonomy definition, what is bloom's taxonomy?